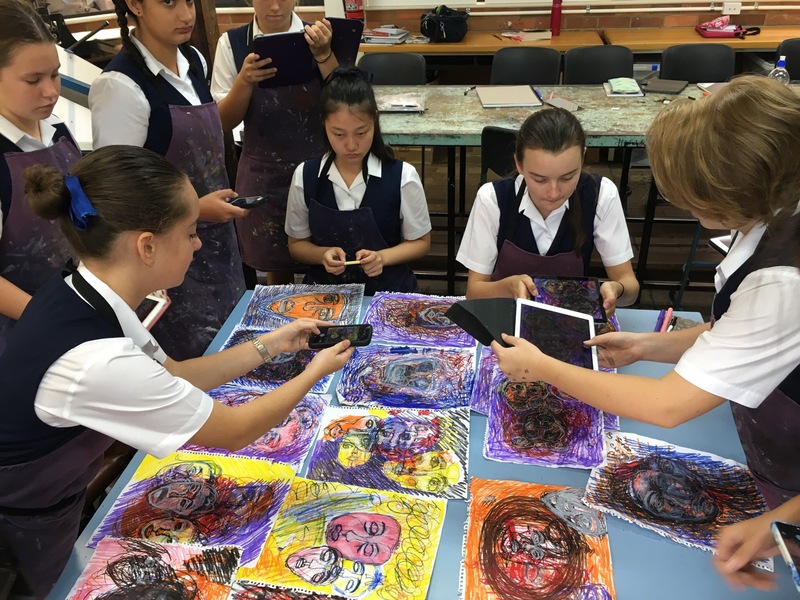 Students in Cathy Hunt’s art classes are constantly blurring the lines between physically created art and digital creations. 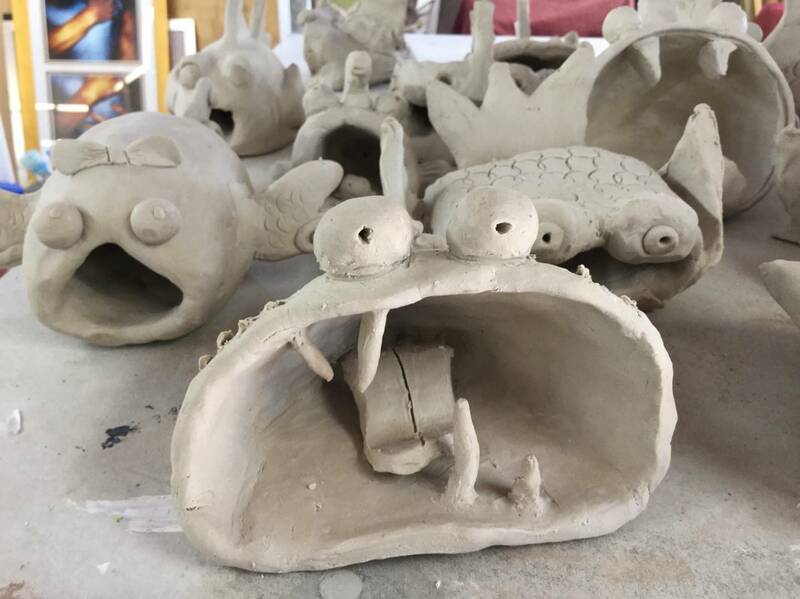 In one project, students created fish out of clay using old pinch-potting techniques. But the project didn’t stop there. They then took photos of their creations and used digital tools to paint on the photos, adding color and design without fear that an unknown glaze would ruin their vision. Once they designed their fish, they developed a storyline featuring their creations for a stop motion animation created by the whole group. When the project was completed students had artfully blended the physical world with the digital one, using the best of both, and creating a finished product that can be put online and shared with the world. The impact of that project goes far beyond a shelf full of clay fish. 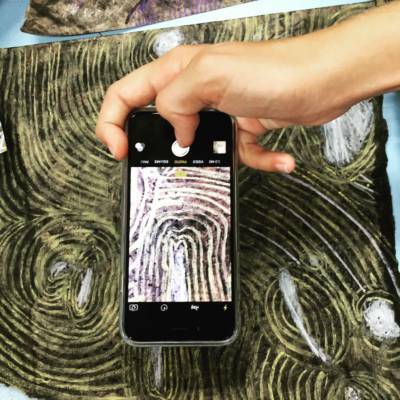 The fish project exemplifies the way Hunt encourages her students to delve deeply into visual art techniques, while giving them multiple points of entry into creativity. In her classroom, technology doesn’t replace oil paints and clay, but it adds facets of design, trial and error, and exhibition to a broader audience that were harder to access before tablets and smartphones became common in schools. “One of the reasons I’m super interested in the digital space for our students is that they’re so used to using digital tools that allow them to go back all the time,” Hunt said. For many students, putting a mark on a page can feel paralyzing, just as the inability to render from life can convince them they aren’t creative. Hunt sees technology as a low-bar way to get students experimenting with creative expression. They can easily undo moves made digitally and document their process along the way, making it possible to step back to the point where they feel they went wrong and try again. “I’m using the concept almost of workflows,” Hunt said, “where you connect apps together or program software together to develop complex or original responses. We don’t have to stay digital with that.” The clay fish project demonstrates that idea nicely. Hunt linked a traditional sculpture project to digital painting, storyboarding, animation and storytelling. She doesn’t see boundaries between physical and digital art anymore; rather she sees them as forces that work powerfully together. Hunt became interested in how technology could play a role in her visual arts classroom several years ago when she noticed how other disciplines were incorporating technology into courses. As the conversation in education more broadly began to move toward a discussion of the digital literacies and modern skill sets like problem-solving, communication and collaboration that students will need, Hunt saw visual arts could contribute. Digital consumption of media and marketing has made it even more important for students to interpret, analyze and communicate visually. And, Hunt didn’t want visual arts to be sidelined as irrelevant in an education space increasingly dominated by technology. “When we’re all talking about higher-order thinking and problem-creating and problem-solving, that’s something that quality arts teachers have been dealing with since the dawn of time,” Hunt said. 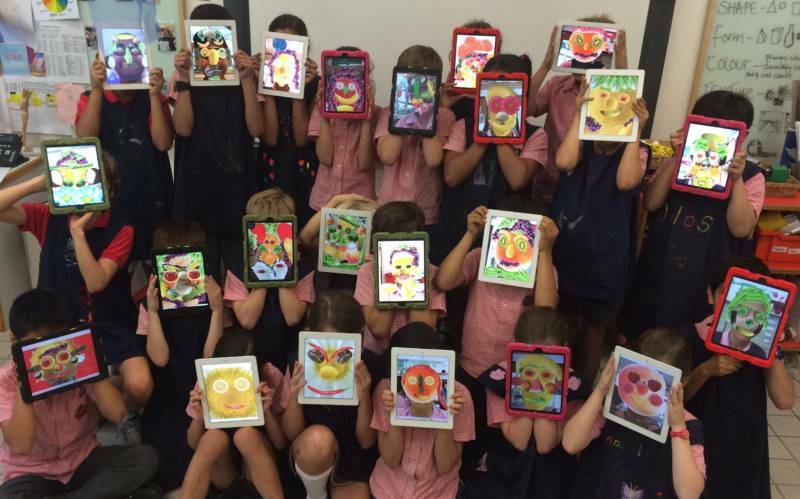 Integrating digital techniques into her classroom has allowed Hunt to demonstrate how a visual arts classroom, led by a specialist teacher, can be the perfect place to hone skills that educators desire for children in every discipline. “Schools that do not have arts programs are absolutely missing opportunities for student growth,” Hunt said. When she isn’t teaching at St. Hilda’s School, an all-girls independent school, she’s traveling the world presenting to other educators and working in classrooms. Her goal on these trips is to help teachers see creativity is a human quality everyone has, and that quality art instruction woven together with academic disciplines can produce powerful learning. “We’re all collaborating and being responsive to our world, to the tools we have, and the people we’re connecting with,” Hunt said. “Teachers don’t necessarily know how to teach creativity, but I think perhaps if we stop thinking about that as much and start thinking about building creative confidence, then we might be on the right track,” Hunt said. Creativity is a difficult concept to pin down, and many students get hung up believing they aren’t creative. But creative confidence comes from giving students lots of entry points to a project and focusing on the process instead of the end product. Hunt wants her students to feel free to follow a track that turns out to be a dead end because learning will happen along the way. 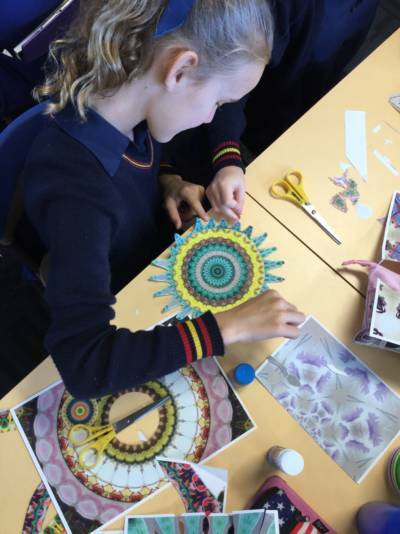 To her, making art is essentially an exercise in building a growth mindset. “If we can find ways for students to interact with purpose and to make mistakes, but rephrase it as just part of the process, an interactive process,” then they can begin to see their work as a ladder, one that they will climb up and down throughout the course of a project. Often art projects start with sketching, but Hunt says that’s only one approach to brainstorming and ordering ideas. She often encourages students to use their cameras, tools they already use to interpret the world and share their experiences. Students may print photos, cut them up and play with the media in various ways until they have an idea. Hunt also encourages them to document their work along the way so they can go back to an earlier stage and try again or recognize at the end of a project that a real breakthrough happened at step three, even if the final product didn’t turn out as envisioned. 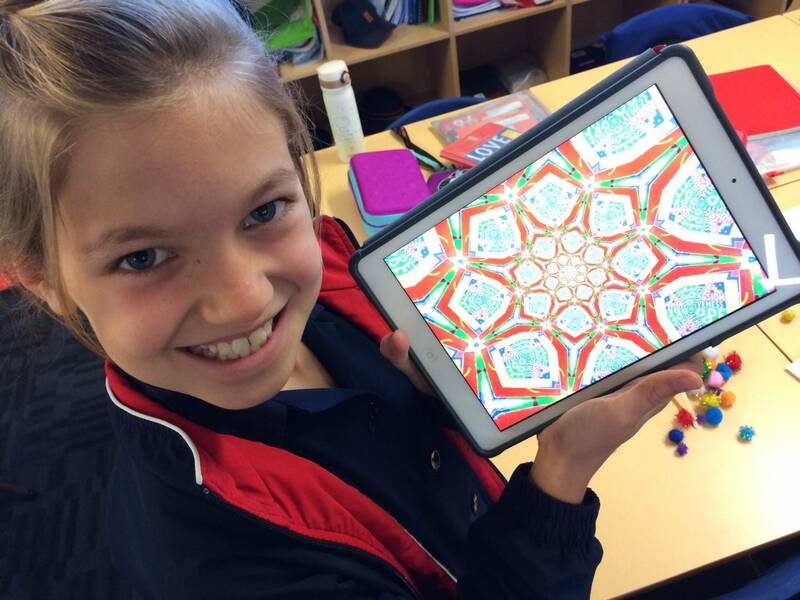 One of Hunt’s favorite tools is the kaleidoscope camera, found in a variety of apps. “I’m interested in how a mirroring lens is breaking up an image,” Hunt said. She’s noticed this simple tool can help students see mundane objects like flowers or a stripe on the floor in new ways. “It supercharges the art-making creative process. 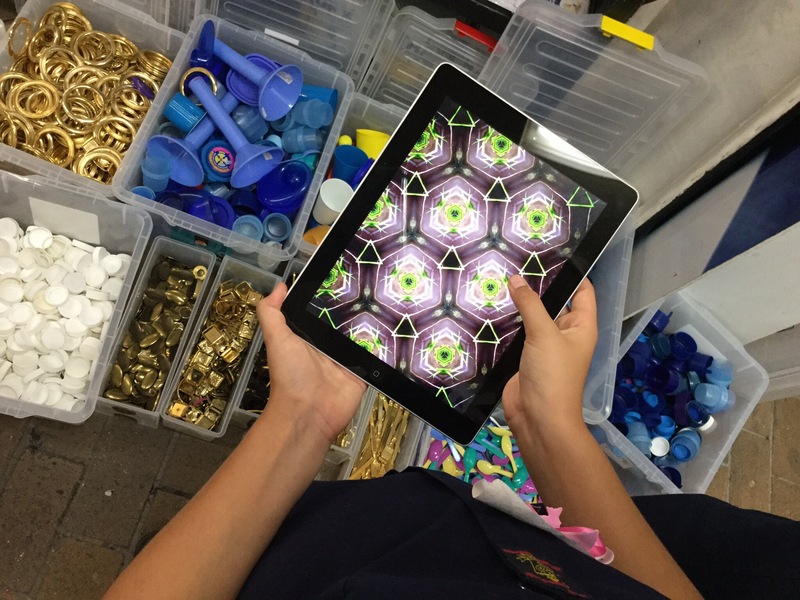 With a live camera you’ve got this active space, this window into the world.” And, as far as tools go, the kaleidoscope camera only helps students see differently. It doesn’t do the work for them. 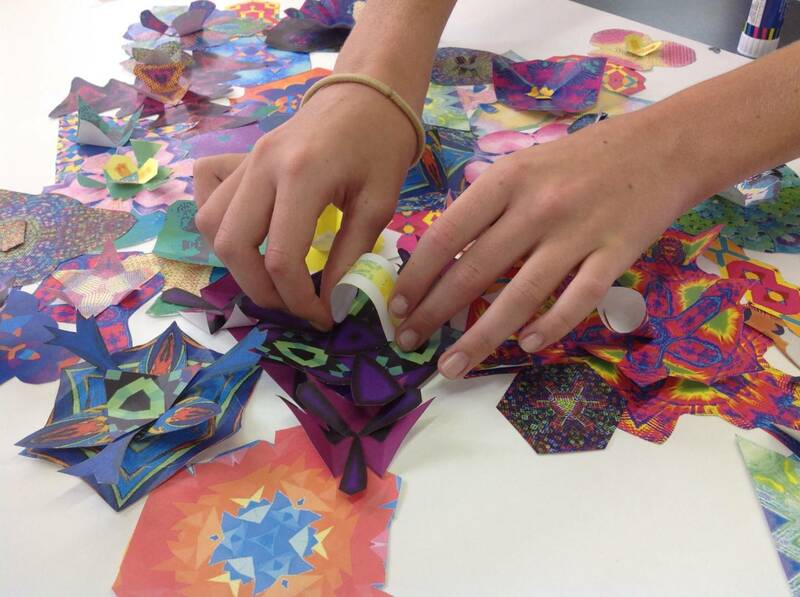 In one project, Hunt’s students took kaleidoscope photos and cut out flower fractals that became part of a huge oil painting with three-dimensional elements. Looking at it, you might never know it had a digital component. And yet, starting from the images of a familiar space made unfamiliar opened up incredible creative avenues for students. “Creating the conditions for creativity in and of itself is at times a really powerful experience,” Hunt said. “From there we have the opportunity to build curriculum.” She’s adamant that students need to manipulate materials in an unstructured way to learn their properties and what might come from them. If her students are working on animation, they play with the cameras and test out the green screen before they ever come up with an idea. “We’re playfully exploring things first, becoming connected to the ideas, and developing a problem to solve from there,” Hunt said. And, she says, often the problem-solving is the easiest part, once the conditions for creativity are present. “If we think about our classrooms as living, breathing organisms, rather than static classrooms, that’s a start,” Hunt said. Her own evolving practice is a strong testament to the idea that change must happen, but that it happens in steps. 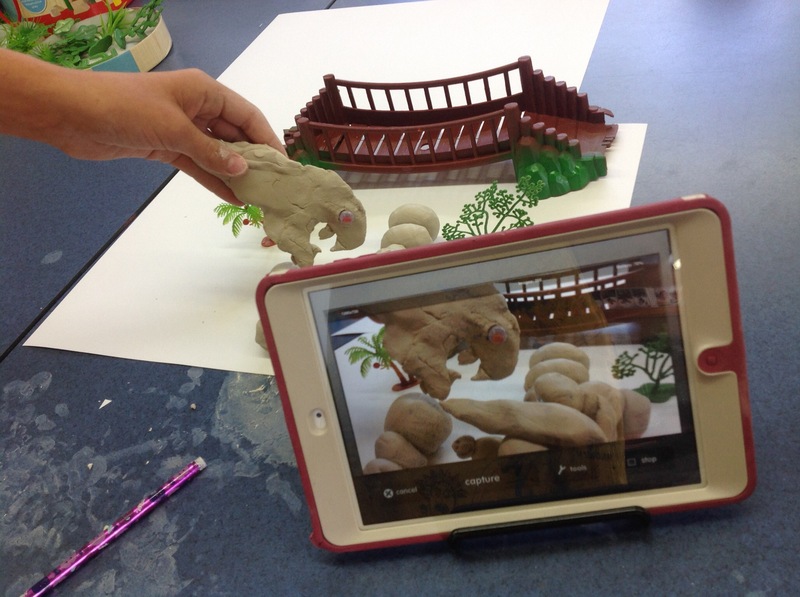 Hunt had no exposure to digital art in her training; it was only through research, connecting and experimentation that she came to embrace what technology could add to her classroom. She started by asking her students what apps they were using and then recognizing that, even without knowing much about the technology itself, she could add perspective on how they might use it. “All of our students are the same in that they are all completely different,” Hunt said. “In each setting we’ve got teachers working with students who have come to the profession because they want to help kids through their learning journeys.” She bases her support for teachers on the premise that teachers love kids, and often finds that from there most educators want to shift practice in order to offer those kids the best learning experiences possible. “I think teachers can share their learning journeys, and talk about mistakes, and talk about areas we can grow, and talk about our massive successes, just like students can talk about their creative process,” Hunt said. And like Hunt’s visual arts class, digital spaces can be powerful for connecting with real audiences about learning, growing and struggle.